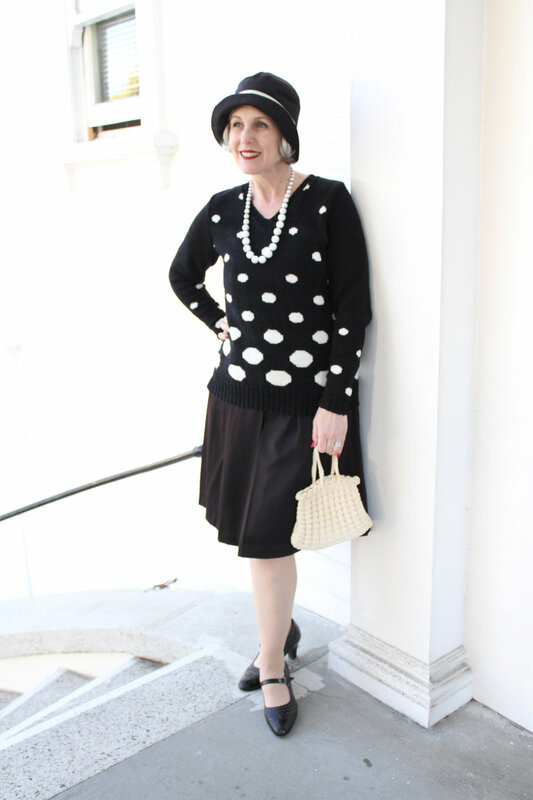 I was recently asked to be a judge for the vintage fashion contest, at the Alameda Vintage Fashion Faire this last weekend and I needed something to wear. Nothing like an event to get one motivated. With a week and a half to finish, I made it happen. Hoorah! I also managed to shorten an existing skirt and make a matching hat out of the same fabric as the skirt. Watching Angela Clayton on YouTube really kept me motivated. That girl gets a lot done. I just love watching her make costumes! My Mom and I found this great vintage apartment entry way to take photos in. 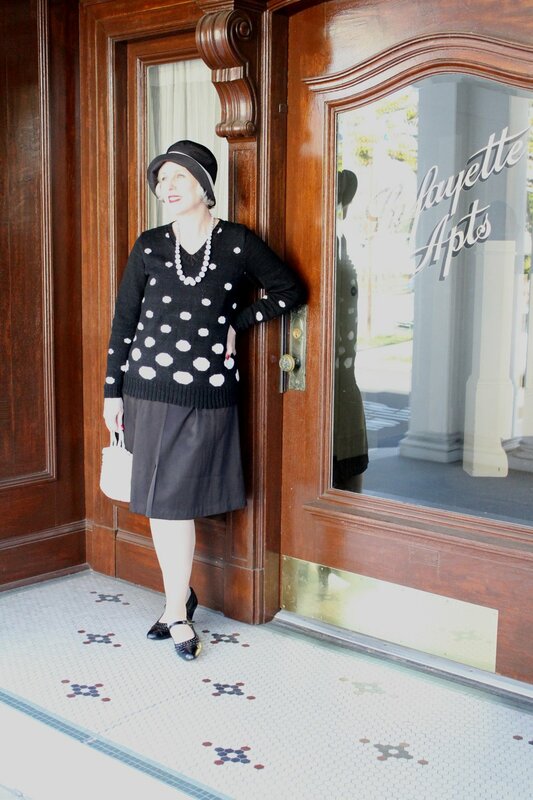 The “Lafayette Apartments” building, is a stark white with a black railing and it’s entry way has gorgeous dark wood as well as decorative gold lettering on the front door. Oh, and really pretty tile! If only I could carry a purse this small on a daily basis. Just enough room for the essentials in that little bag. 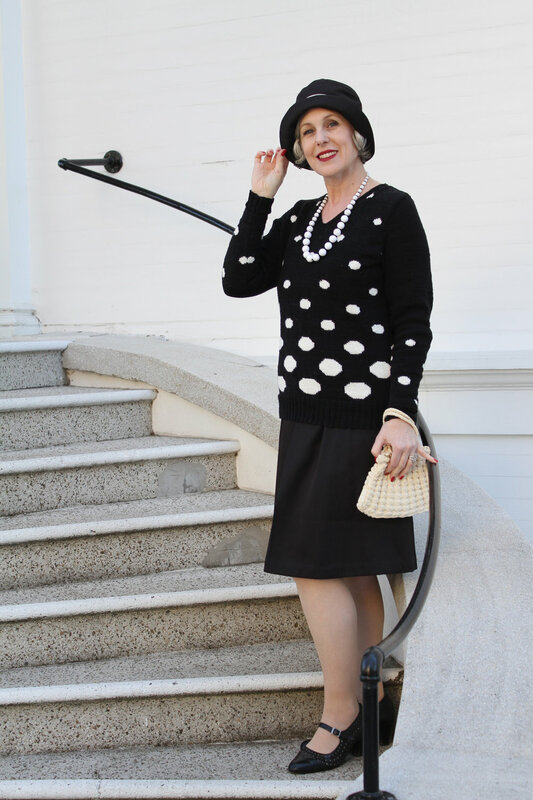 In these photos you can both the Cloche and the necklace close up. I was so pleased to manage finishing it all on time. I really tried to get the same feeling of the inspiration (photo at top) style by creating the necklace with the beads graduated in size. It was really luck of the draw to find two necklaces, the same color, in the same place, that had beads in graduated sizes. Cloche - D.L. 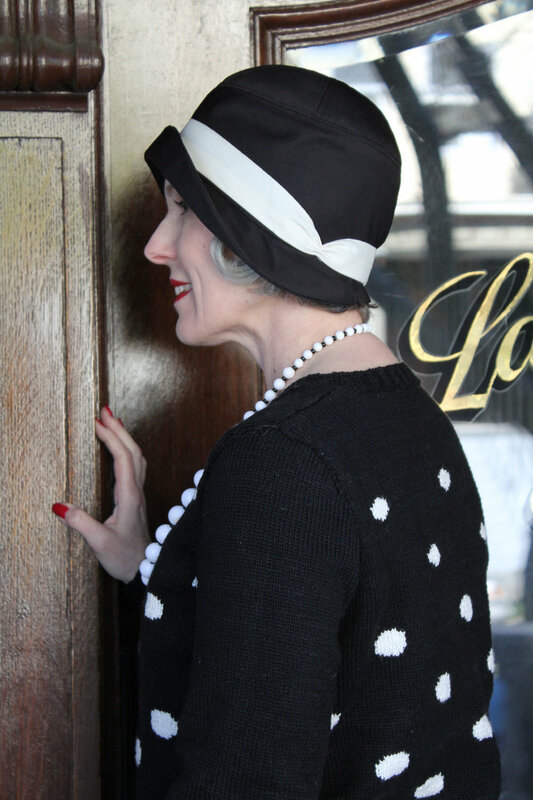 Designs #127 1920’s Cloche, originally purchased on Etsy. It looks like you can also find it on her website. Skirt - Originally made & adapted from 1933 Ladies Day Dress With Puff Sleeve Option - Reproduction Sewing Pattern #T7357 from Vintage Pattern Lending Library - I shortened it from the top (at the hipline) and then pleated out extra fullness and reattached the waistband. I never wore it as a long skirt, so I’m glad to have a new alternative. I do love this pattern, however and have it made up in Red, which I do wear quite often. Necklace - Me Made from two vintage necklaces, found at a local antique store. Purse - purchased from a local yard sale. I thought you might like to know how I finish hats. My past seems to be catching up with me as I dig back into my early 20’s and the time, when I had a (very SMALL) hat line that I sold to stores in San Diego, Los Angeles, San Francisco and Berkeley. While most of the vintage patterns either don’t require a lining or have the lining finished off where the brim meets the crown, I really like to have a grosgrain ribbon sewn inside as a “sweat band”. It also functions to keep the lining out of sight, which can be helpful, if you want to use a wild or contrasting colored lining. After you completed the outer hat and attached the brim, insert the lining into the hat, wrong sides together. Line up your ribbon to the brim stitch line, and stitch ribbon to seam allowance, 1/16” from edge of ribbon. As you come to the end of the ribbon, having sewn around the entire circumference of hat, fold the raw edge under itself and stitch down. Clip your threads and push the ribbon towards the lining. If it doesn’t naturally stay up, inside the lining, you may want to hand tack it in a few spots. I find that giving it a quick press with the iron will also do the trick. Now onto new projects and finishing up some I have in the works. Until Next time, Happy Sewing!